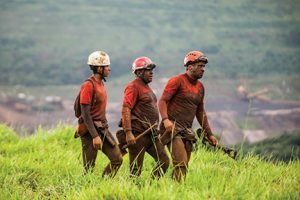 Three dirty firemen returning of a searching operation in Córrego do Feijão – place of Brumadinho city that was destroyed by mud after one of Vale’s dam breakdown. If there is one good thing to come out of the Brumadinho tragedy in Brazil, it’s that it has shocked an entire industry into taking action. The tailings dam failure, which occurred at a Vale mine i Brazil on Jan. 25, killed more than 300 people – most Vale employees – and released 12 million cubic metres of tailings. The failure occurred only three years after the Fundao (Vale and BHP Billiton) dam disaster in Brazil, which killed 19 people, and four years after the Mount Polley (Imperial Metals) failure in British Columbia, which thankfully, did not result in any casualties. The loss of life in the latest incident, combined with the disturbing frequency of tailings dam failures in recent years, has galvanized the industry. In late February, the UK-based International Council on Mining and Metals (ICMM) announced a process to create an international standard for tailings dams. And in early March, the Global Mineral Professionals Alliance (GMPA), an international group that includes the Canadian Institute of Mining, Metallurgy and Petroleum and the Society for Mining, Metallurgy and Exploration, announced its own Global Action on Tailings initiative. Tom Butler, ICMM’s CEO, says the ICMM initiative, which has the unanimous support of council, was agreed to at an extraordinary meeting of member CEOs in February called in response to the Brumadinho failure. The ICMM standard, which will be defined by an independent panel of experts, is expected to include a consequence-based tailings facility classification system with requirements for each level of classification; a system for credible, independent reviews of tailings facilities; and requirements for emergency planning and preparedness. This standard, which would provide a baseline for best practice and verification for tailings facilities, would be adopted by ICMM members and then hopefully also by the rest of the global mining industry, Butler said. Butler says a lot of pressure has been coming from investors. Butler says the group is aiming to have the review completed and recommendations laid out by the end of the year, a timeline he says is ambitious but achievable. “We’re not going to start from zero,” Butler says. “There is a body of existing good practices and best practice around the Canada), and Australia. The collaborative nature of the effort is important, says Charles Dumaresq, vice-president of science and environmental management with the Mining Association of Canada (MAC). Aside from ICMM and the GMPA, the Canadian Dam Association and the International Commission on Large Dams (ICOLD) have also been active in working on parts of the tailings construction, management and inspection puzzle. “A number of people have identified that perhaps the worst possible outcome would be at the international level, to have conflicting sets of guidance from different organizations that are the same in concept but different in detail, or maybe emphasize different areas, and people are left wondering, ‘which one do I follow?’” says Dumaresq, who oversaw the recent revisions to MAC’s Tailing Guide and its Operation, Maintenance and Surveillance (OMS) Guide. MAC is an affiliate member of ICMM and was present at recent ICMM meetings to discuss the initiative. Their tailings documents were also circulated to members ahead of the meeting. ICMM, whose members include many of the world’s largest international mining companies, including Vale and BHP, made a similar announcement after the Fundao dam failure in late 2015. The difference between the guidelines that came out of that process and what ICMM intends to do this time is that the first was a high-level governance framework while the new standard will lay out in a lot more detail what is best practice for the management of these facilities. Bryan Ulrich, a vice-president in Stantec’s mining practice and an authority on tailings storage and disposal, welcomes the ICMM effort to put together international standards as currently, standards vary from jurisdiction to jurisdiction. Ulrich said in response to emailed questions. Ulrich points to the Cyanide Code, a similar voluntary program that member companies that produce gold and silver have committed to and that has yielded operational and environmental improvements. 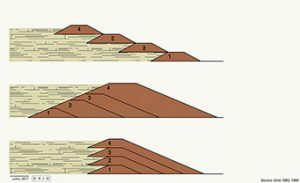 While the causes of any tailings dam failure are unique and complex, there are some commonalities between incidents. “One of the recurring themes is around the human factors that are involved,” says MAC’s Dumaresq. “The decisions that get made – whether they’re made with the fullest information, whether they’re made at the right level within the organization, the communication breakdowns, assumptions that get made – things like that. “We’re human, we sometimes make mistakes, we all have our own biases,” he adds. Dumaresq notes that this is one of the strengths of MAC’s OMS guide and any other systematic approach to tailings management that put checks and balances in place to mitigate the risk of human errors and biases. In terms of easier, near-term actions the industry can take to prevent catastrophic failures, Ulrich says miners need to shift the focus from the lowest-cost tailings storage options to de-risking their projects. Another way to reduce risk is through the engagement of an engineer of record (EoR), who should be involved in design, construction and operations of the tailings facility. “Ideally, the EoR should have a long-term engagement, and should be the continuity person, maintaining institutional knowledge when personnel at the mine move,” Ulrich says. Reducing water and waste A big focus in tailings and processing technology is in reducing the amount of water stored in tailings facilities. For instance, great advances are being made in the volumes of material that filtered tailings (or dry stack) technology can handle from a around 6,500 t/d to tenfold that amount, Ulrich says. That said, Ulrich adds that filtered tailings is not a cure-all, and there really is no one-size-fits-all technology for tailings. Filtered tailings can also still pose chemical risks that need to be addressed. There are also sites that reduce the amount of water not dramatically, but enough that the tailings behave differently and tailings facilities can be designed in a different way, Dumaresq says. In the longer term, there are many R&D projects under way examining the reduction of waste earlier in the mining process and ultimately, the elimination of waste entirely. While some aspects of the tailings issue will take longer to tackle, it’s essential to capitalize on the intense focus on the topic because of Brumadinho, says Dumaresq, so the industry can make headway towards making potentially transformational changes before that spotlight fades. “The positive that comes from these tragedies is that it gets people talking and creates an environment where we can push towards bigger changes that might be harder to get if it wasn’t for this level of attention,” Dumaresq says.